December……More on Tongzhou……we found three huge indoor vegetable markets within five minutes of our estate. You spend under £4 and get bag fulls of veg , eggs(loose) and fresh un-packaged tofu in many a flavour and texture (loose and cut to size in front of you), plus a big beer, some cakes and 2 magnum ice creams. These things never cease to please me. Modern technology aside, the whole thing here keeps haphazardly calling up random hazy memories of Britain in the 70s. There are all sorts of things popping into my brain that I’d forgotten about. Of course central Beijing has the usual trappings, over designed DJ bars and overpriced coffee houses … restaurants where the emphasis is on image and gimmicks, rather than food. 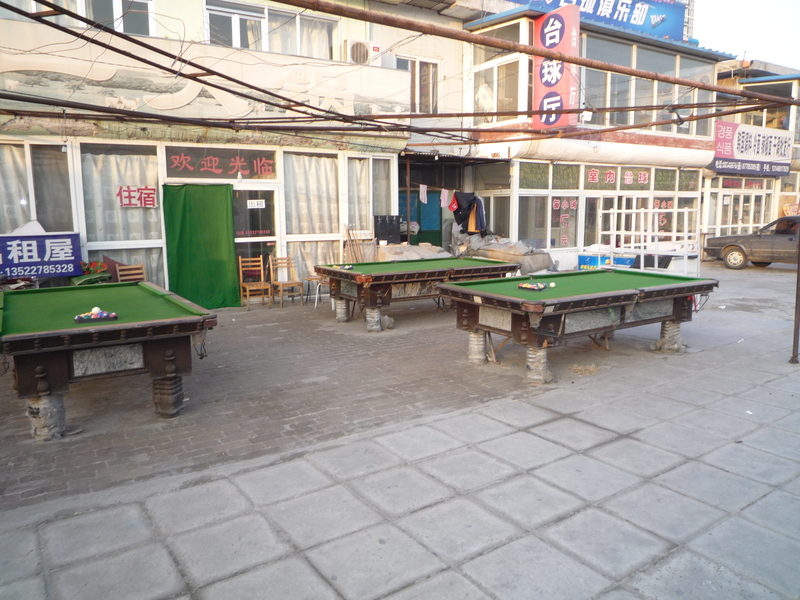 Tongzhou is grimy, a bit tatty, the pavements are uneven, the overhead cables are a mess. But so many things here and in China as a whole run in a way that we’ve maybe forgotten about in the west – fresh, loose food, money back on bottles (a free beer for every 7 empties you take back), conductors on the buses and trains, cheap cheap subsidised public transport, bins emptied daily, stairs and street cleaning daily, pump attendants at garages, assistants on every aisle at the supermarket or department store (and you can only pay at the dedicated cashiers desk, which is separate from the sales assistant – all very Grace Brothers, and rather funny when the cashier is 5 feet from the vendor), all sorts of ways you can refill and re-use rather than buying again and throwing away… and people seem pretty happy. Markets are there seven days a week – they don’t just crop up on Saturdays and Sundays. They are central to local life. So far, it’s not all driven by profit maximization and automated phone options. There are too many people willing to work the most menial of jobs. But it cant be far away…. It’s here now, in the glamorous centres of Beijing, Shanghai and other cities, and it’s spreading outwards rapidly. There was this strange calling noise from outside the flat one day – turned out it was the knife sharpener man on his bike. The knife sharpener! I’d completely forgotten about him. In fact I’d forgotten the whole concept of sharpening knives. Dormant memories flashed up again out of nowhere. I might have lived a sheltered existence as a soft southerner in London for a long time, but the last time i remember such a man coming round our street with his little machines, was when I was small, in the 1970s.